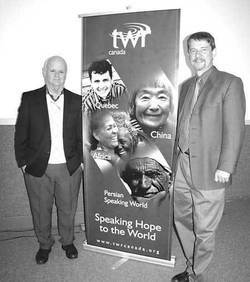 Speaker Alberto Gonzalas and Director of Fund Development for Trans World Radio Canada, Gary Roebbelen, with a TWR poster following the TWR dinner at Calvary Baptist Church. Each year, TWR holds a dinner and information night for its supporters in Wetaskiwin. A guest speaker, generally with video assistance, tells about the particular branch of the work where he or she is involved. This year the guest speaker was Alberto Ganzalas from Cuba. He was a young person in Cuba at the time of the revolution in 1959-'62. The revolutionaries under Castro denied that they were communists until after they had won in '62, so the churches had supported them. As soon as Castro had control, everything changed. By 1963, all Christian bookstores were closed, all Christian radio programs were prohibited, and the last shipment of Bibles was destroyed at the Havana port. In 1963, Roberto Gamzlas entered seminary to study to become a pastor. In 1965, more than 55 pastors and 60 seminary students and Gonzalas were arrested and interred, along with criminals and drug addicts, in a concentration camp which the people of Cuba knew nothing about. Those in the camp were told that they were societies scum, and they had no idea when they would get out. Although TWR began broadcasting from its new station on Bonaire in 1964, in the concentration camp Ganzalas didn't hear it until 1966. After his release, Gonzalas considered trying to escape Cuba, but he and his wife came to realize that they were to serve God in Cuba where he became a pastor. He says that God took care of them, and today all their children are also serving God in Cuba. Today, Cuba still denies Christians the right to use media to preach the gospel, so Gonzalas continues to produce broadcasts in Cuba for transmission over TWR from Bonaire. There was a change in the churches in the '90s as people hungered for God. The TWR broadcasts continue to be used in many ways to support the growing Christian presence and full churches. At least one church has been founded by TWR listeners. In the concentration camp, a general insisted that the Christians had to change their minds. However, 45 years later that same general insisted on seeing Gonzalas, embracing him and praying with him as a fellow believer. It was the general who changed his mind. Alberto Gonzalas identified these lessons as coming out of the Cuban experience. “Never stop preaching, even when people reject the message. “Never stop praying, even when God seems not to hear. “Never stop believing, even when the results are the opposite of what you expect. “Never stop rejoicing, even when suffering is the daily routine. “Never stop hoping, even when failure threatens. “Never stop praising, even when life is miserable. Around the world, millions are responding to the gospel broadcasts. Every country receiving the broadcasts has its own story. Radio reaches where missionaries cannot go, where neighbour dare not tell the gospel truth to neighbour, where there is no other way to hear the wonderful news of hope—Jesus saves.